Tips To Help You Enjoy Your Wedding Planning! The holidays are upon us, which also means the start of engagement season and hence wedding planning season. 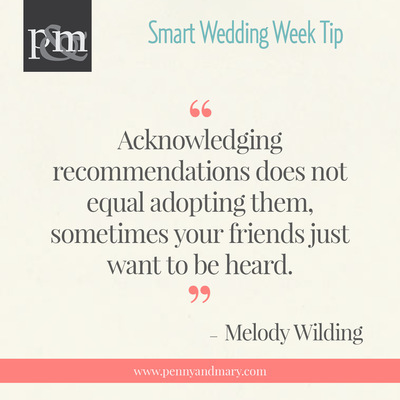 Now it’s not uncommon to hear people say they enjoyed wedding planning more so before they got engaged. That’s because Pinterest-ing is so much easier than dealing with overwhelming choices, trade-offs and drama. To help provide perspective, we have below some really insightful tips from Smart Wedding Week straight from our panelists: celebrity wedding expert Samantha Goldberg, Day-of-coordinator Lisa Wrinkley, second time DIY bride Stephanie Golio and therapist Melody Wilding. Feel free to save these images as reminders to help you through process. If you have problems saying no, your planner or your designated planning ally can help champion what you want. It’s not enough that they are your bestfriend, you need someone who is articulate and can manage difficult situations. There are two major reasons for this. First, things that are meaningful to you but not are traditionally tagged “wedding” are more often less expensive. Second, most wedding vendors require a non-refundable deposit, so think twice before committing. Most suggestions come from a good place. If someone is really insistent, suggest they do that for their wedding or wedding anniversary. It’s best to be proactive about things that can be avoided. Worried about potential drama? Talk to the people involved about what you don’t want to happen. Check out our book for a more thorough guide on setting up your wedding planning for success. Follow this column for more tips on managing the different aspects of wedding planning.